For Co-Op Casual Friday this week, we're going to unplug the console for a bit. Not all games require a controller, disc, cartridge, or quarter to play. Board games are an excellent way to spend time. Though we typically think of board games as being for kids, or all based on luck, there are plenty of high quality board games out there that are neither. 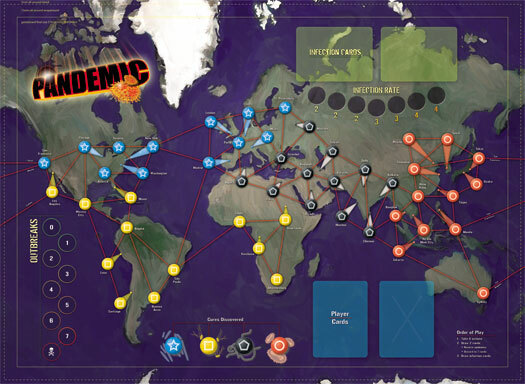 Today, we'll look at a great new board game that is simple enough to be accessible for non-gamers, yet deep enough to satisfy a diehard gamer's strategic brain: Pandemic. The best part about Pandemic? It's cooperative, meaning not only we can cover it here at Co-Optimus, but you don't have to worry about getting your face punched in when you safely pass Boardwalk for the third time in a row. Plus, we've got a guest report from Co-Optimus legend "justabaldguy"! Pandemic has a great theme: players are members of a disease control team. The world is being overrun by four deadly sicknesses, which are spreading across the globe like wildfire. Your team's overall mission is to research the cures for each disease before time runs out; this is accomplished by collecting five city cards of a given disease's color at a research station. Each team member has a different ability. The scientist can cure a disease by matching only four cards. The researcher can trade any city card to another player located in the same city, while other players are far more limited in how they can trade. Other roles are the dispatcher, medic, and operations expert, and each break the rules in their own special way. Players have four actions per turn, such as movement, removing disease, or "flying" to other cities by playing matching city cards. Sounds easy so far, right? Not so! At the end of every turn, new cities are revealed from a special infection deck. 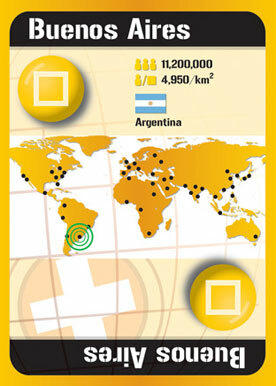 New infections, represented by small colored blocks, are added to the revealed cities. If a fourth cube would be added to any city, this causes an outbreak, and each neighboring city gets another cube instead. Chain reactions can occur, and before you know it, an entire continent could be infected. That's not the worst of it, though. Periodically, epidemic cards pop up in the player deck. An epidemic places three cubes on one city, all at once, plus raises the infection rate, meaning more infected cities show up each turn. As you can imagine, there is a real sense of urgency, almost like panic as the board begins to fill with infection cubes. There are several ending conditions: running out of player cards, depleting the reserve of extra infection cubes, or causing the eighth outbreak. 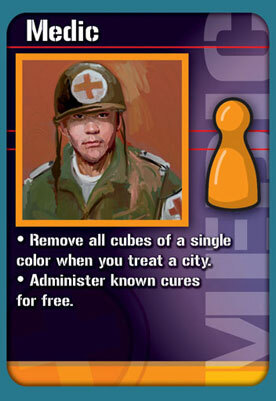 The sole victory condition in Pandemic is researching the cure for all four diseases. The key strategy in the game is balancing clearing the board of disease while at the same time working towards trading cards to research the cures. In my first game, playing with several experienced players, we won, and it seemed easy. However, when I got my own copy, and played it at home, things seemed to be going well, but we ran out of player cards with only two cures researched. I'm sure with more playtime, things will get less difficult. There's a lot to like about Pandemic. The mechanic of using cards both to move and to cure diseases is quite elegant. The clearly defined roles allowing players to break the rules feel almost like a class-based RPG system. The game is very visually appealing, with a beautiful board and clearly designed card art. The best part, of course, is the co-op. Most board games are competitive in nature, and when you are sitting right across the table from your opponent, feelings can get hurt. 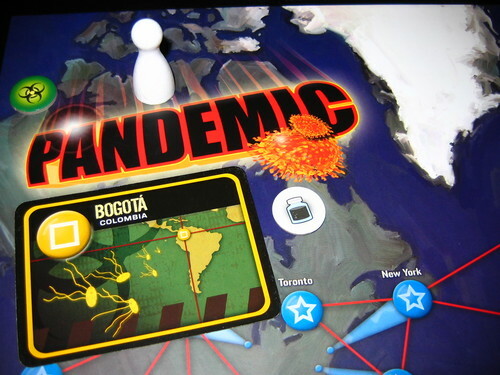 In Pandemic, the game rules are the opponent. Besides this, the powers all work together in ways that promote cooperation. For example, the Dispatcher can move the Medic around the board easily, curing far more infection than the medic could alone. Pandemic is a great game, but why take just my word for it?